Two dramatic finishes, a record 45,000 registrants and heat marked the 30th edition of the LaSalle Bank Chicago Marathon. In uncommonly high temperatures paired with high humidity, the winning times were accordingly slower than usual in Chicago. At the 8:00 am start, the temperature was already 78 degrees, paired with 80 percent humidity. As the temperature continued to climb to near 90 degrees, race director Carey Pinkowski and his medical director decided to end the race. Runners who hadn’t reached the halfway mark by 11:45 am were ushered off the course, and others still on the roads were urged to drop out or walk in. Less than 25,000 finished. Unfortunately, Chicago was the second major marathon severely affected by heat this year—in the spring, the Rotterdam Marathon was canceled. Nonetheless, the battles for the win were thrilling. 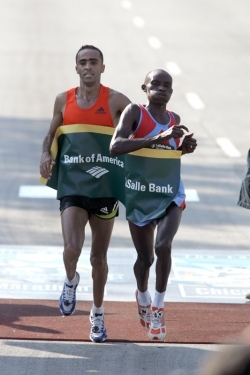 In the men’s race Kenyan Patrick Ivuti and Moroccan Jaouad Gharib ran just inches from each other for the final few kilometers, and were even closer at the finish line. Ivuti was given the win, with both clocked in 2:11:11 hours. The women’s finish was perhaps even more stunning, as defending champion Berhane Adere (Ethiopia/2:33:49) flat-out sprinted the last kilometer to surprise Romanian debutante Adriana Pirtea, who assumed she had secured victory and was waving to spectators as Adere sped by her in the final few meters. Pacemaker John Yuda (Tanzania) took the lead pack through the halfway mark in 65:52 minutes. In his wake were Ivuti, two-time marathon world champion Gharib, defending Chicago champion Robert Cheruiyot, perennial Chicago presence Daniel Njenga and KIMbia’s Benjamin Maiyo. 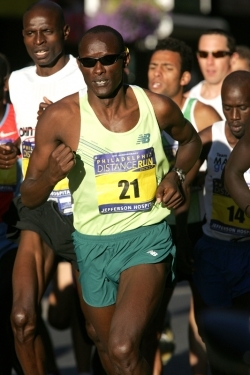 Due to the weather, two past Chicago champions, Felix Limo (2005) and Evans Rutto (2003 and 2004), dropped out. In all, more than half the elite field failed to finish. Maiyo was the next to drop off. At a water station at 35K, Cheruiyot fell back with stomach problems, and Njenga soon after couldn’t keep pace. Gharib then surged a couple of times, but couldn’t shake Ivuti. Down the homestretch, the two produced the closest finish in Chicago history, with Ivuti somehow securing a winning margin of just .05 seconds! Njenga held up well to take third in 2:12:35. Although Cheruiyot faded to fourth in 2:16:13, his finish was enough to capture the first World Marathon Majors title. With 80 points, his lead in the 2006-07 series is insurmountable for anyone running New York City, the final race of the series. Maiyo took fifth in 2:16:59, and his KIMbia teammate Christopher Cheboiboch overcame early physical problems to move up through the field and place sixth. 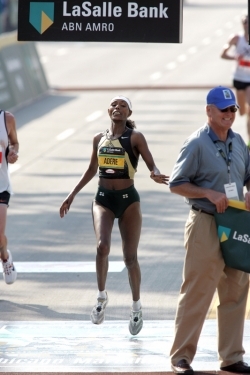 In the women’s race, Adere led the pack to the half marathon mark in 1:15:11. Between 25K and 30K, it became a two-woman race, with the novice Pirtea drafting off the defending champion. Suddenly, with about seven kilometers to go, Pirtea took advantage of a moment of weakness from Adere and got away from her. With just two kilometers, Pirtea had a 30-second lead and seemed assure of a most memorable first marathon. Even in the final stretch, Pirtea looked to be the clear winner. But the veteran Adere was now sprinting on the far side of the road, out of sight and earshot of Pirtea, who was high-fiving and waving to the crowd. Adere passed Pirtea wide with just 50 meters to go, and by the time the Romanian realized what had happened, she didn’t have enough time to react. Adere won in 2:33:49, the shocked Romanian finished three seconds later. American Kate O’Neill had a good debut marathon, taking third in 2:36:15. Liz Yelling (Great Britain/2:37:14) and Benita Johnson (Australia/2:38:30) finished fourth and fifth. KIMbia celebrated a fine double win at the 7th Boston Half Marathon, which had a record 3,591 finishers. Tom Nyariki outsprinted defending champion Samuel Ndereba by one second to win in 62:20, more than 30 seconds under the old course record. Edna Kiplagat matched her teammate by taking the women’s title. She clocked 73:36 and was well ahead of fellow Kenyan Caroline Chepkorir (74:04). Sabrina Mockenhaupt won her debut marathon Sunday in Cologne, clocking 2:29:33. The 26-year-old German beat the qualifying time for the 2008 Olympic Marathon and also fulfilled race organizers’ hopes for a home win. In contrast to Irina Mikitenko’s superb debut a week earlier in Berlin (2:24:51), Mockenhaupt experienced a tough last 10K in her first marathon. But the opposition was not strong enough to make it a close race. Ethiopia’s Worknesh Tola had taken an early lead, but faltered after passing halfway in 73:20. She finished third in 2:34:28, while Austria’s Susanne Pumper took second with 2:33:27. Kenyan runners took the first three places in the men’s race: Daniel Too clocked a personal best of 2:11:05, beating Samuel Muturi (2:11:27) and Benjamin Itok (2:11:33). Luminita Zaituc won the accompanying half marathon. Preparing for the Frankfurt Marathon in three weeks, she clocked 71:54. Adding all events, a record field of 28,773 athletes entered yesterday’s races, including 10,200 starters in the marathon. A few days after her comeback at the BUPA Great North Run in Newcastle, England, Paula Radcliffe announced that she will run the ING New York City Marathon on November 4. For the British marathon world record holder (2:15:25), it will be her first marathon since her victory at the 2005 World Championships. At the half marathon in Newcastle, she was surprisingly beaten by American Kara Goucher, who ran 66:57 to Radcliffe’s 67:53. With the Olympic Games in Beijing in mind, Radcliffe seems eager to return to the classic distance as soon as possible. In 2004, she made a successful comeback of another sort in New York. Ten weeks earlier, in the worst moment of her career, she had dropped out of the Olympic Marathon. She gained a measure of redemption by then triumphing in her first attempt on the New York course. “I am delighted to be returning to the marathon in New York, because the race is a very special one in the world of marathoning. This year there is an exceptional field,” said Radcliffe. The 33-year-old will compete against world champion Catherine Ndereba (Kenya), defending champion Jelena Prokopcuka (Latvia), Berlin’s winner Gete Wami (Ethiopia) and Boston champion Lidia Grigoryeva (Russia). It is the strongest women’s field ever in New York. Paula Radcliffe could also score points for the World Marathon Majors series (WMM) for the first time in her career. Furthermore she could have a decisive influence on who will win the series this year. At the moment, Wami leads with a margin of ten points ahead of Prokopcuka. If Radcliffe wins, it wouldn’t be enough for Prokopcuka to place one ahead of Wami to take the jackpot due to the points system.